A unique collaboration between University of British Columbia (UBC) zoologists and U of T Engineering’s aviation expert Professor Philippe Lavoie provides new insights into how gulls configure their wing shape — known as wing morphing — to stabilize their flight. The findings could be used to design more efficient flying vehicles, including soaring drones for farming or environmental monitoring. Although a gliding bird’s ability to stabilize its flight path is as critical as its ability to produce lift, relatively few quantitative studies on avian flight stability have been completed. This is what brought UBC researchers Christina Harvey, Vikram Baliga and Professor Doug Altshuler to Lavoie’s wind tunnel lab at the University of Toronto Institute for Aerospace Studies (UTIAS). The researchers measured the lift and drag on 12 different wing shapes, all with slightly different elbow and shoulder angles. They determined that with a simple adjustment of a gull’s elbow joints — either to expand its wings outwards or inwards — gulls are able to transition across a broad range of wing shapes to stabilize glide. When soaring, the wings are fully extended and have a more rounded shape, which increases their stability. When taking off or landing they are tucked in more and have a flatter shape. 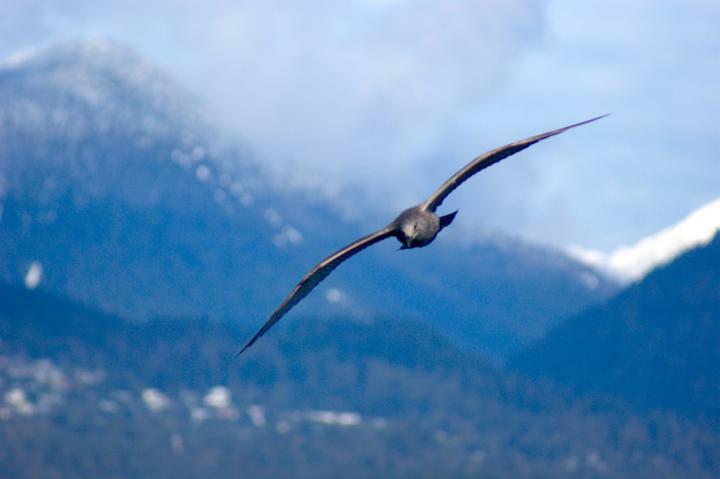 Studying how gulls use wing shape to soar long distances and control their flight is particularly interesting to Lavoie because of the potential to inform the design of future aircraft, including fixed-wing unpiloted aerial vehicles (UAVs), also known as drones. “The benefit of morphing is that you don’t need bulky control surfaces during flight and it makes it easier to take advantage of energy harvesting through soaring,” says Lavoie. He imagines fixed-wing drones that could coast on thermal updrafts as they scan pipelines for defects, look for signs of drought or crop disease on large farms, or monitor the movements of caribou herds. Fixed-wing drones can also be used to track the extent and evolution of forest fires. The researchers also stressed the benefits and importance of interdisciplinary research.